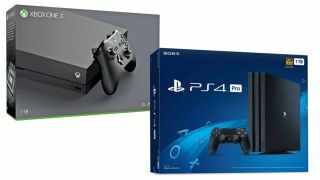 Xbox One X vs PS4 Pro - which should you buy in 2019? As the bargains begin to drop in 2019, the idea of upgrading your console suddenly becomes a more enticing idea. But there’s one big question to address: should you pick up Sony's console with some PS4 Pro deals or go for one of the many Xbox One X deals instead? It’s actually a tricky one to answer as it all depends on what you really want to get out of your new console. One has more exclusives, the other has more free games (if you’re paying for online services), for example. Which is more important to you? Then there are differences in 4K outputs, UI, storage, capture and so on that can register as a complete deal breaker or no great shakes depending on what matters to you. So let’s take a look at the both and weigh up the options on offer. Both the PS4 Pro and Xbox One have a 4K output but that’s not entirely the same as 4K resolution. The Xbox One X does best here, with more games hitting, or getting close to, the 3840p that actually constitutes ‘4K’. The PS4 Pro has a wider range of resolutions but averages out around the 2440p mark. Realistically, though, you won’t see a huge difference, especially with a 40-ish inch screen, no matter how much some technical breakdowns carefully explain how one number is bigger than the other. Larger resolutions often come at the expense of frame rates as well, which is why games often offer a resolution mode, which locks a 30FPS frame rate for 4K, or a performance mode that aims for 60FPS at a lowered resolution. HDR, or high dynamic range, on the other hand - which provides dynamic coloring, richer tones and crisper blacks - is largely the same across both machines. Plus, your TV will have a larger impact on how the HDR is displayed than a console. PS4 Pro vs Xbox One X - which has the best games? When looking at the games on each console it all depends on what you class as ‘best’. Third party games, so Bethesda, Rockstar, Ubisoft etc - basically any developer that isn’t owned by Sony or Microsoft - usually make games for both, so not much to pick there. The question you need to ask yourself is: do you want new exclusives, or more free games? If it’s exclusives you’re after then it’s PS4 Pro all the way. Sony has far more internal studios producing games like God of War, Spider-Man, Horizon Zero Dawn, Uncharted 4 and so on. Xbox One on the other hand has Xbox Games Pass, a monthly subscription separate to its Live service that gives you access to around 100 games, including all Microsoft’s recent and upcoming titles, some slightly older games (think Fallout 4, The Division, Doom etc) and loads of backwards compatible 360 titles. Sony actually has PlayStation Now, which includes a bunch of older PS2 and One games, and you can download them instead of streaming, but the catalogue of titles isn’t quite as strong. Both Xbox One and PS4 require a monthly subscription to get the most out of their respective online services. Whether you go for a PlayStation Plus code or pick up a Xbox Live Gold 12 month option (both offer a range of durations though), you’ll get access to online multiplayer, cloud saves, some free monthly games and occasional Store discounts for both platforms. There isn’t a huge differences here really - the basic services work the same for either, and the quality of free games offered can vary wildly. If you’ve already tried either or both controller you’ve probably got an idea about which you prefer. If not you really should try them in the shops. Don’t ask anyone else what they think, as it’s entirely subjective: just as many people love a PS4 controller as swear by an Xbox One pad and we’ll see the heat death of the universe before either will concede. Whatever your choice we have PS4 controller cheap deals and Xbox One controller cheap deals if you want to take the sting out of picking up a second one. Being able to capture and share those little gaming moments (or glitches) is a big part of modern gaming. And if you want to do that a lot on your new console then there’s no question it has to be a PS4 Pro, unless you’re going to buy external gear (and here’s the best capture devices for PS4 and Xbox One, if you’re looking). The PS4’s built in capture lets you record for up to an hour, with editing and sharing functions that are powerful, simple and flexible straight out of the box. The Xbox One X on the other hand is less so. You can capture a maximum of two minutes of gameplay, edit and post directly directly via the console. But there are limits to resolution as well as length, and you can only retrieve the clips by posting them to Twitter or Microsoft’s OneDrive cloud. If you want to do more you’ll need an external hard drive. Doing that will A) format the hard drive in a way that means you can do very little else with it and B), no longer let you edit your footage on the Xbox One X, requiring you transfer the footage to a PC to edit.